Here are some pictures to help you identify beads, I only used seed beads, as they are what I prefer and are unchanged in production for hundreds of years, and are more widely available in styles and colors, and more affordable. 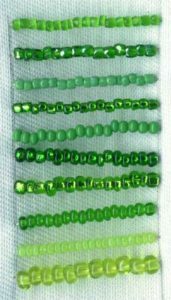 I use the most common variety, Czechoslovakian Seed beads, in size 11/0 (11 beads per inch). There are more colors in this size of this variety than any other. They come in other sizes from 5/0 to 23/0 – the higher the number the smaller the bead – but occasionally in your buying you may find the perfect color, but in 10/0 or 12/0. for embroidery that’s perfectly fine, you can vary sizes as you need, so have fun!11/0 is a guide not a rule since the color variety in that size is practically unmatched in may other. Czechs are more evenly sized than from other cheaper retail store grade seeds from countries like Taiwan and Japan. The cost of these is actually cheaper than buying from your local craft store. The most common way to find them is in “hanks” – the average “hank” is ten 20″ strings of beads doubled in half for about $3, your price can vary depending on style, 3-cuts are a little higher, like $3-6 a hank depending on color or finish, but the hanks are about HALF the size of the normal 11/0 hank. A 11/0 hank is about 3,000 beads or 60 grams. Compare this to the local craft stores 10 gram bags for like 89cents. You actually can save money at the bead store and come away with more. The quality and colors selection are also far more superior than any other kind of bead as far as I am concerned. There are also Delicas, which are not referred to as seed beads but by their name, which are a perfectly molded tiny bead, shaped like a cylinder. 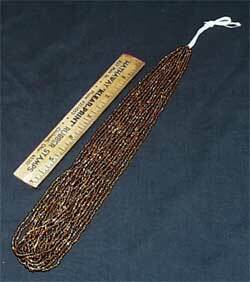 These are widely used in loom and peyote work as their perfect shape ensure more uniform work. They are more expensive and more limited in selection, or can be, than “Czech seeds.” Go to the sources page and go to a couple of the retail links, they sell Delicas if you need any further info. Below are some finishes and basic seed bead types, this is an enlargement of the actual size of 1″ wide. This is clear or milky glass over a gold foil, the difference in appearance is pretty stunning. Much richer and warmer, these pictures don’t even even show it all that well. These are pretty much only found at bead store, I can only find them at bead shows. Clear glass with a silver foil interior. They come in square and round holes. I like the square, they are sparklier. This is clear or milky glass over a gold foil, the difference in appearance is pretty stunning. Much richer and warmer, these pictures don’t even even show it all that well. These are pretty much only found at bead stores or bead shows. In this case Blue clear with a purple lining of paint or lacquer. While these are way cool, DO NOT USE these for embroidery or anything washed. Besides not being period, the lining can and most probably will wash out and possibly stain the area. These are a jewelry only item in my book. These probably most closely resemble period beads. They are liks short snapped off bugle beads, each one is different due to this. They are more square and round and have sharp edges, but what three cuts have that the period ones do not, is facets, or more like flat carved off areas. They are irregular and randomly “cut”but these beads sparkle like all get out. These are usually only available in 12/0 or 9/0. Exactly like the above beads except the glass looks like bundles of fiberoptics, hard to see here, the picture of green beads later on may show better, but these are simply stunning things. The color variety in these is far reduced, mainly your basic rainbow, but when used they bring it up a notch as they shimmer similar to tigers eye. This is your plain every day average seed bead. Non-transparent and solid colored. This is a white bead like above but with a pearl-like finish. It doesn’t show well here, but it’s much shinier than ordinary plain opaque. This can be on clear or transparent glass, but it’s a higher clear coat type shine. A variation on this is iridescent finish, which has the same high shine but in that multicolored highlight like a oil slicked puddle. A clear bead, in this case it’s a milky white. Translucents can got form a semi milky to a crystal clear. These are basically acid washed to give a smooth silky matte finish, they can be transparent or opaque, this is transparent. They can also have a iridescent overfinish, but not shiny. This entry was posted in My Articles and tagged article, seed beads. Bookmark the permalink.